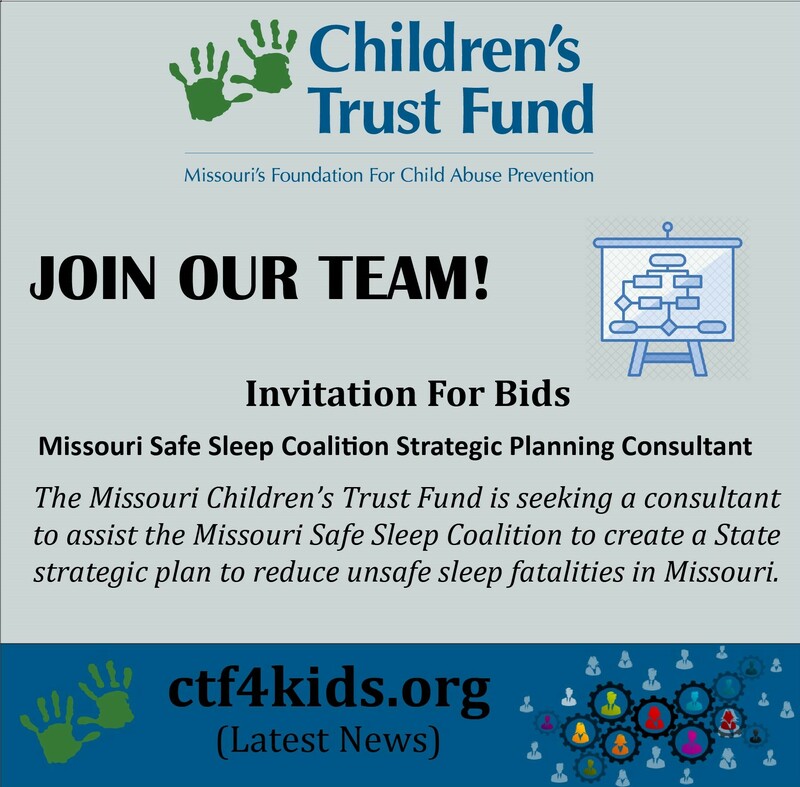 The Missouri Children’s Trust Fund (CTF) is seeking a consultant to assist the Missouri Safe Sleep Coalition to create a State strategic plan to reduce infant unsafe sleep fatalities in Missouri. 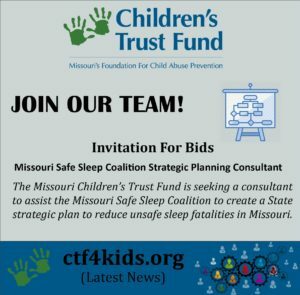 • Create a State strategic plan to reduce infant unsafe sleep related fatalities in Missouri that includes specific objectives, activities, measures, etc. • Please identify the primary individual(s) who will work on this project. • What are the applicant’s individual and/or agency experience and knowledge related to infant mortality, collective impact and safe sleep initiatives? • What is the applicant’s individual and/or agency experience in developing/producing infant safe sleep strategic plans? Please provide an example of the applicant’s work plan process in developing a safe sleep strategic plan and the final product. • Why is the applicant interested in working with CTF on the issue of child abuse and neglect prevention as it relates to infant unsafe sleep fatalities? • Please provide a Scope of Work, including a related timeframe, for the requested project. • Assuming a project period of March 1 – August 30, 2019 (six months), please provide an itemized budget detailing the basis for costs (how costs were calculated) to conduct the tasks outlined in the Scope of Work. Completed proposals shall be emailed to Paula Cunningham at paula.cunningham@oa.mo.gov by 5 p.m. Wednesday, February 20, 2019. Selection shall be based on the best and lowest bid. Further inquiries may be made to Paula by email or by calling 573-751-2266/5147. Thank you.